As hunting season approaches, avid hunters are likely looking for ways to make their outdoor trek a bit easier. That goal can be easily accomplished with the lineup of Bighorn UTV’s offered by Bennche. 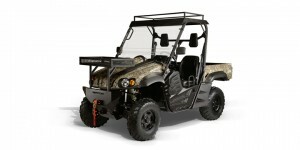 Long regarded as one of the best names in utility vehicles for all season, the company’s Bighorn models are designed to be operated in wooded environments that offer uneven terrain and plenty of obstacles during every outing. Use of full camouflage makes these models even more of an asset during hunting, allowing them to sit undetected while they’re not being used. Three differing models are available for hunters who need a new method of transit outdoors, with each model offering a unique and compelling feature set that will appeal to a different type of hunter. Regarded as the smallest of the company’s Bighorn UTV models, the Bighorn 500 utility vehicle is designed to be both compact and quiet, with enough passenger room for two people and plenty of cargo room to store guns, ammo, and any other items needed throughout the day. The vehicle also features front cargo storage and a windscreen, making it suitable for use at higher speeds and making it a bit easier to haul even a bit of extra cargo throughout the morning. The 500 HD model comes with a single-cylinder engine with four-stroke design, capable of producing up to 22.8 horsepower and 471cc of displacement. The engine features liquid cooling and an automatic transmission, ensuring the vehicle is both a smooth ride and very easy to drive. The included fuel tank stores 7.6 gallons of unleaded gasoline, which should be more than enough to power the equipment through a typical day of hunting. At 1,146 pounds, the 500 HD is also heavy enough to be safe on steeper grades. The upgraded Bennche Bighorn 700 HD is decidedly the midrange model among the company’s three hunting-targeted utility vehicles. Interestingly, the 700 HD has the exact same dimensions as the entry-level 500 model. It’s just as long and just as wide as that model, with a roughly identical look and feel in everyday use. The 700 HD also features comparable, if not identical, front and rear storage, and comes with the same 2-passenger capacity as the 500 HD. Where this model differs, however, is in the power under the hood. For those hunters who traverse even more challenging terrain throughout the season, the 700 HD is suitably powerful. The four-stroke, single-cylinder engine is maintained in this model, but it produces 33.5 horsepower at its peak. That’s roughly 33 percent more horsepower than the 500 HD, which is great for hills and steeper areas. The 700 HD comes with the same fuel tank, transmission features, and liquid cooling as its 500 HD counterpart, but weighs in slightly heavier. The equipment’s heavier overall weight, while using the same footprint as the 500 HD, also ensures that it’s a bit better on steeper grades. The equipment’s heavier weight and upgraded engine also work together to provide a smoother ride. When it comes to passenger capacity, none of the previous two models can compete with the Bighorn 700X Crew HD model from Bennche. This mode was designed to carry four passengers to hunting camps and locations throughout the day, with a full second row of seating that makes this model significantly longer than the other two models that were previously mentioned. The Bighorn 700X Crew HD UTV model also comes with enhanced cargo storage and a more sturdy design, which should be expected of a UTV charged with carrying twice the amount of passengers as the lower-end models. Under the hood, the Bighorn 700X Crew HD is similar to the 700 HD model, with an identical 33.5-horsepower engine. The Crew HD’s automatic transmission is upgraded with greater control over gears and directions, which makes this model easier to maneuver even when it’s loaded to capacity with passengers and hunting cargo. Liquid engine cooling features allow the equipment to handle heavier loads without overheating or suffering form maintenance headaches, which will certainly come as a relief to new buyers. The utility vehicle features electronic fuel injection just like the other two models available to today’s hunters, for easier ignition no matter the conditions outside. The same, 7.6-gallon fuel tank is included with this model, for sustained operation throughout the day that doesn’t demand refueling after every use. Shank’s Lawn Equipment is a great place to find Bennche Bighorn UTVs, from entry-level 500 HD models to the large and impressive 700X Crew HD with room for up to four people. Whether it’s in-person at the Shank’s Lawn Equipment location, or online at ShanksLawn.com, those interested in the Bighorn series will find new UTVs, plenty of accessories, and an easily searchable listing of Bennche’s OEM replacement parts if a bit of equipment maintenance is required. This entry was posted in Uncategorized and tagged Bennche UTV, OEM Replacement Parts, Shankslawn. Bookmark the permalink.